There are many reasons to get soundproof curtains apart from the obvious ones. Most of them are excellent at keeping the light out, balancing the room temperature, and let’s face it, a lot of them are very stylish, too. However, since every manufacturer basically puts out the same bold claims of efficiency and value for money, finding the best noise reducing curtains isn’t always an easy task. If you’re struggling with this decision, we’ve got something that might help. These are my top 8 picks for sound absorbing curtains that you can use in any room. How Noisy Is Your Neighborhood Really? 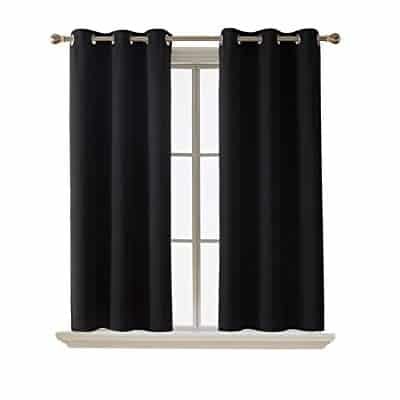 Nicetown offers a wide range of soundproofing curtains and the Blackout line is perhaps its best seller. It has an affordable price tag and uses efficient three-pass microfiber layering to reduce outside noise. Although the curtains have the Blackout tag, this is somewhat misleading. This line is not the company’s most efficient curtains if you want to keep the light out too. While it is successful to some degree, this will only depend on your choice of style and color. The lighter the curtains, the more light will pass through them. On the upside, the black model will handle anything you throw at it as it is 99% impervious to light and UV rays. Due to the thick layering, these Nicetown curtains should also do a good job of balancing the room temperature all year round. And, as far as maintenance goes, the curtains are machine washable. Another important thing of note is that the extra thickness would also limit the noise coming from inside the room. With all else equal, curtains with more layers are better at reducing echo and noise resonance in the house. Best Home Fashion has its own line of thermal insulated blackout curtains. There are various colors and styles to choose from. You may also choose between five length variations from 54” to 96”. The material is 100% polyester which means it’s machine washable and not too heavy. However, the same issue can be seen again regarding the opacity. As is the case with regular blackout curtains (without adding an unwieldy vinyl layer), the lighter colors of these allow more sunlight to pass through. The installation shouldn’t be too difficult though, as there are 8 grommets per panel. With a weight of just under 4 pounds, putting them up can be a one-person job. The extra thickness and the thermal layering contribute towards balancing the room temperature, keeping most of the noise out, and creating a relaxing environment for dates, parties, or late sleepers. 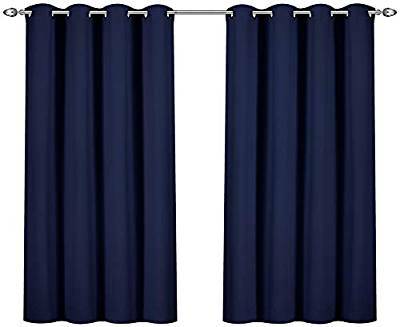 These curtains come with a width of just 42”, and they’re also limited in length as they only come in two sizes: 63” and 84”. These may not be your go-to choice if you want to soundproof all the windows in your home. Still, the curtains are pretty light and only feature six grommets each, so the installation should be smooth. I should note that not even the black model will keep out all the light, never mind the lighter varieties. The curtains are not as thick as their competitors. Due to this design choice, which is toward keeping the cost down, the thermal insulation is not the best for energy saving. The silver grommets are stylish with any color you choose. However, because of the size restrictions and less efficient triple weave construction these are a good choice only if you take into account the low price. So they might be of interest if you’re shopping on a budget for a smaller room or two. This Utopia Bedding line of blackout sound deadening curtains comes in two sizes: 52”x63” and 52”x84”. This makes them somewhat harder to match, but they should be workable in plenty of homes. 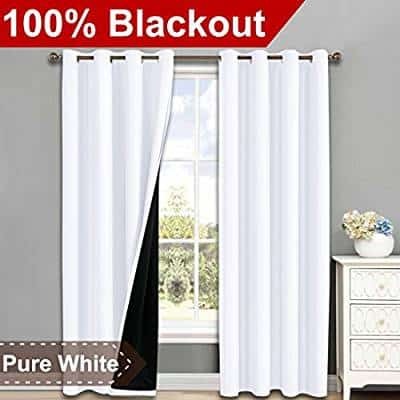 The color variety is a bit underwhelming, but you can rest-assured knowing that the darker curtains are efficient at blocking light and sound. These curtains also use a high-end triple weave construction with thermal layering. The installation isn’t too hard considering the size, and there are only 7 back loops per panel. You’ll also get two tie backs for the set. Among other things, in case you don’t want to feed your plants only artificial light. The material is fully washable – just make sure you set the washing machine for under 30 degrees. The curtains are advertised as being capable of filtering out 60% of outside noise. The efficiency will vary depending on what noise frequencies are most bothersome in your area, but for the most part you should be ok against light traffic. In terms of muffling the sound coming from inside your home, these curtains will do ok as long as you’re not planning to have a band rehearsal. Nicetown’s Full Shading line might truly be one of the best soundproof curtains available on the market. They’re not the cheapest that Nicetown has to offer, but the quality seems to match the premium price tag. 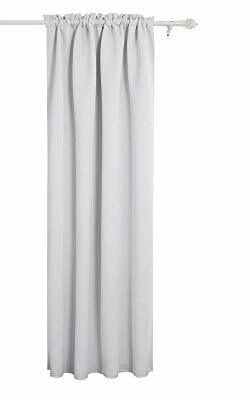 This line of sound absorbing curtains comes in seven sizes, as well as a variety of colors including black, gray, and white. 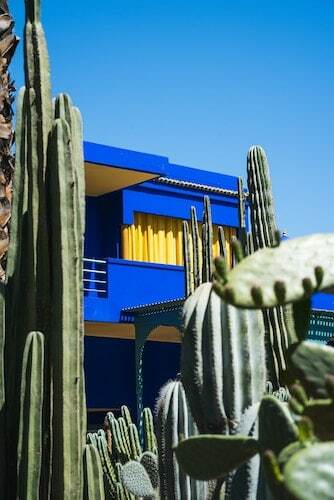 You shouldn’t have a hard time finding a style that matches your home. What’s awesome about these curtains is that even some of the lighter colors seem to be great at blocking out light, which means the energy efficiency is superior. Interestingly enough, the curtains are heavy but not overly thick. In terms of soundproofing, there aren’t that many better options to choose from if you want to soundproof your home with something fashionable. As an added bonus, the Nicetown Full Shading Curtains should also prevent enough sound from bouncing around in your home. They might also minimize the amount of noise you’re contributing to your neighborhood, so they should be a good choice for late night dinner parties. Because of the thinner design these curtains aren’t the most durable on the market. They are quite easy to clean, good at balancing room temperature, and efficient at muffling even low frequencies. However, when judging the price tag versus the longevity, not everyone will be pleased, especially not those shopping on a budget. If you’re just as interested in elegance as you are in soundproofing capabilities, then perhaps the Flamingo P blackout curtains will interest you more than other curtains. You can get these curtains as a two panel set or as a one piece. You have the same color variety regardless of size, and the same soft faux silk fabric that can give your home some extra class. The two panel sets are 52” wide and go up to 108” in length. The wide single panel model is 100” wide and reaches a maximum of 96” in length. You’re almost certain to find something suitable for your home. But, how do these curtains fare in terms of noise cancellation? – A bit better than mid-range sound absorbing curtains but nowhere near the efficiency of premium models. Considering that these curtains have a premium price tag, let’s just say that you’re getting a bit more style over soundproofing. Still, depending on where you live you may not need more. 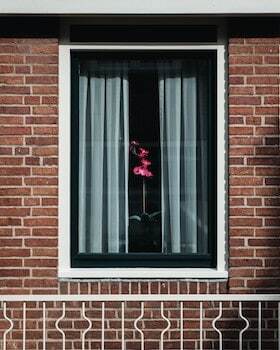 These Flamingo P curtains come with a double layer design which also features a blackout lining. The manufacturer claims that they block out 100% of sunlight and UV rays, and are effective at blocking wind and sound as well. There are 8 grommets featured on each panel and 16 grommets on the wide single panel. The headers are 3” which will make the installation go a lot smoother. This may come in handy especially when dealing with the single panel design. Although the curtains look especially luxurious, they’re rather simple to clean. Throw them in the washing machine and set a cold cycle. Avoid using bleach or a super-hot iron and you’ll have them looking good as new. 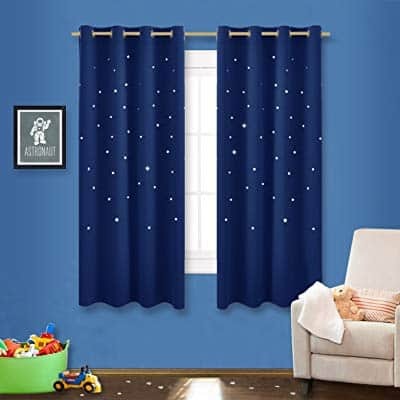 Also known as Romantic Starry Sky curtains, I won’t say that you’ll feel that romantic vibe when you look at them. But the design is very nice and the curtains give out a kid-friendly vibe for the most part, regardless of the choice in color. The curtains are rather heavy, so the installation won’t be the easiest. You may need a second pair of hands if you’re looking to get the single panel version. The extra weight also translates to better in-house noise cancellation. This is especially important if you’re going to place these curtains in a kid’s room or nursery. Your neighbors might also thank you since the curtains should reduce the noise output of a screaming infant. The blackout capabilities are very impressive and somehow to be expected given the extra thickness of the drapes. 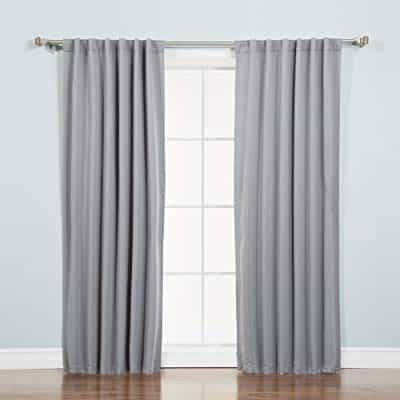 The same triple weave construction Nicetown uses in their premium curtains is featured in these curtains too. This will give you quality soundproofing during the day and cancel out anything you may hear at night. This is one way you can ensure a good night’s rest for you and your kid. Another advantage of the Starry Sky curtains is that they come without chemical coatings. If you’re interested in eco-friendly drapes, you might have just hit the jackpot with these ones. What’s also surprising is that even without special coatings, the color is fade-resistant. That’s as long as you wash the fabric according to the instructions – cold water and no bleach. 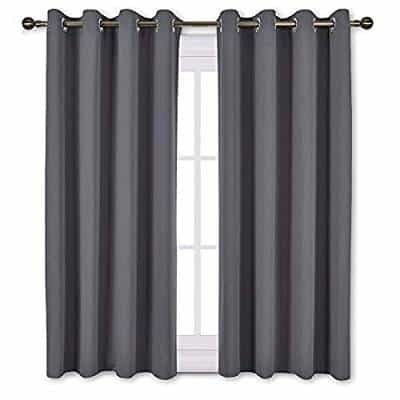 This Deconovo entry is a set of single panel blackout curtains in six sizes and numerous colors. Although these curtains may be easily used around the entire house, they’re probably best suited for the living room and the bedroom as those rooms tend to have wider windows and the curtains will look nicer there. With Deconovo you’re always certain of one thing – capable curtains that don’t look dull. The curtains are supported by 16 grommets, the colors of which generally match the color of the fabric. There is no mechanism to pull the curtains up which may be somewhat inconvenient for some people. The sound absorbing quality is pretty good considering that the single panel is also triple weaved, which means you get thermal insulation, a soft layer, and a blackout lining. Do keep in mind that these curtains work best for exterior noise. They’re soft for a reason. They don’t have the necessary thickness to filter out the noise inside the house. But, they will minimize the echo in the room. These curtains feel soft and have an eye-catching texture which is quite evident even with the darker colors. They’re also priced a bit lower for the quality, which means you can add a touch of luxury to your home without breaking the bank. If you’re familiar with how sound travels then it should be obvious how curtains work. If not, here’s the short version. Whenever sound waves hit a material, there can be three outcomes of the interaction. The first is reflection. You notice this effect in large halls as the sound bounces off the walls. 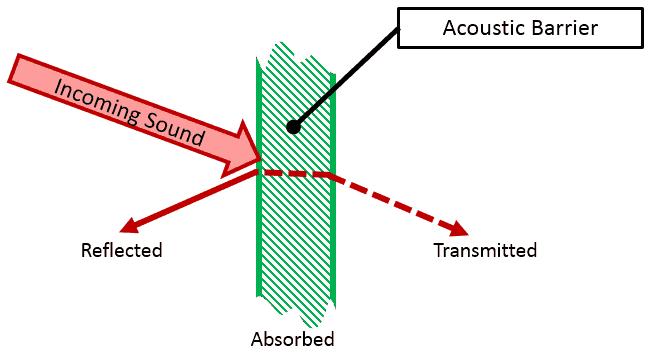 The second interaction is when sound passes through the material. You notice this in office spaces or in homes with thin walls. The third possibility is sound absorption. When sound hits porous materials, part of it can be absorbed. As a result of this, the energy of the sound waves is turned into heat. The energy of sound waves is so small that the converted heat only causes negligible excitation in the molecules of the absorbing material. So the temperature of the material won’t actually go up, but it does muffle some of the noise, depending on the efficiency of the material and how loud the noise is. Curtains don’t exactly block sound. Instead, they use a number of layers of fabric to absorb as much as possible instead of reflecting the sound waves. It’s a muffling effect which sometimes works both ways. The most efficient soundproof curtains on the market are also able to reduce sound reverberation inside your home and contain the sound inside the house. If you’re thinking of using curtains to better soundproof your garage for band practice, you can’t really use the same sound absorbing curtains you buy for the inside of your house. You’ll need something a lot thicker than regular soundproof curtains to keep the noise inside. In these situations, the outside noise will rarely be loud enough to interfere with your jam session. However, better be safe than sorry. 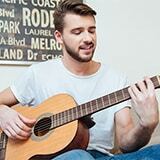 If you want efficient soundproofing for a music room, you’ll want two types of soundproofing. Of course, in most cases, you’ll be better off with using special acoustic curtains or studio insulation (soundproofing foam), even on the windows as it will absorb vibrations better. Everyone would like these two features to go hand in hand. Unfortunately, this is not always the case. Heavy curtains will generally have better sound deadening properties. This is because they use multiple layers to muffle the sound. What this ultimately means is that installing soundproof curtains can get complicated, especially if you have no one around to help you. However, just because it’s tempting to get lighter curtains which you can install and remove super quickly, it doesn’t mean you should. Heavy curtains are almost always more efficient, and it doesn’t really matter at which end of the spectrum you look. Even some mid-range soundproof curtains that are extra thick may be better than thin sound absorbing curtains that cost top dollar. Always look for extra fibers and multiple layers. Thermaweave or thermalayer are the common terms you should be searching for. These materials will give you more fibers and thickness, which means better sound absorption. Another cool feature to look for is extra liner. An additional layer of lining such as blackout liners will do even more for your soundproofing. This may also save you the trouble of having to buy window liners which can be a pain to use. Believe it or not, there are plenty of sound absorbing curtains which you can’t stuff in a washing machine. Some are hard to clean at home just because of the sheer size. Others are made with special fabrics which may require dry cleaning. The longer and heavier your curtains, the more often you’ll have to clean them. Try taking this into account when making a purchase. After all, they should make your life more comfortable and not harder. Consider that not everyone lives downtown or next to a construction site. In order to save money and have easier maintenance, pick your curtains according to the outside noise levels. If all you’re worried about is the occasional lawn mower or kids riding bikes, you won’t need to go out of your way to get the best soundproof curtains on the market. To see how efficient the curtains are, you should check the manufacturer’s specs regarding soundproofing and crosscheck those levels with online charts to see what types of noises the curtains can keep out. Here’s a fun fact you may not know. You have a couple more options to absorb the excess noise in your house. Curtains are good for exterior sounds but using soundproof bedding and sheets is great for the interior. These types of products come in handy in nurseries or even in a home office. If you’re not sporting the full leather executive look, then you could invest in noise absorbing bedding and covers. This way the buzz in your house is toned down and a lot more bearable, even though it’s harder to absorb the lower frequencies. One thing you should know is that even the best sound deadening curtains will still let some noise in. Traffic noise in particular is hard to cancel out. What the curtains actually do is make it more bearable. Low frequencies are hard to muffle, and noise doesn’t just come through your windows. A lot of it makes its way into your house through the walls, vents, cracks, etc. Don’t think that paying more can let you hear nothing but your own thoughts. What else is there to say about noise reducing curtains? As it turns out, no matter how much you pay you won’t be able to tune out everything. The best options are usually those that offer more perks aside from the noise cancellation itself. 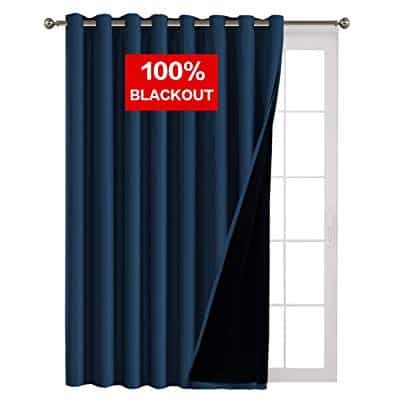 That being said, the Nicetown Blackout Curtains offer the best value for the money. You get balanced curtains that tune out most of the noise and the sun, and without breaking the bank. If you’re looking for something less soundproof but more stylish, Flamingo P would be your best bet. There’s hardly anything as luxurious on the market that has the necessary layering to keep most of the noise from entering your home.